Tower Hamlets Archives display correspondence and minutes of meetings between Ernö Goldfinger and the London County Council (LCC), as well as objection letters written by nearby residents to the proposal for a 26 storey tower and the response they received. I am sadly unable to share images of these as copyright restrictions and reproduction costs apply but I encourage you to visit the archives and have included links to facilitate your visit above and I have transcribed excerpts of this material below. Text in red indicates where handwritten notes have amended and annotated the typewritten texts. The original client of the tower was the LCC. Its chief architect Hubert Bennett was at pains to promote Goldfinger’s landmark proposal during the design phase. An original sketch layout of three 15 storey point blocks is rejected and replaced by Goldfinger's single slab tower scheme. Scores of residents in nearby two- storey terraces wrote in objection to the sheer height and scale and the concomitant loss of sunlight and pressure on local services. In response, Bennett praised the "high sense of visual drama" that the building would give to the area and dismissively promised "surrounding residents should benefit from a considerably improved outlook." During the past year, the number of briefs sent to me has considerably decreased, a total of only eight sites having been received. In order to estimate future commitments, it would be helpful if you could let me know which sites, having been reported, are now confirmed; and which you would consider likely to be confirmed within the first half of 1962, for which we might reasonably expect to receive briefs. As you will imagine, it is a matter of some concern that so few sites are becoming available, and I should appreciate any help you may be able to give to improve the position. The Director of Housing draws attention to the need for special consideration being given to living conditions near the new road from Blackwall Tunnel. Mr Adamson produced a sketch layout as a guide to the architect of the type of development required. The layout showed three 15 storey point blocks. The actual heights would of course be determined by the number of dwellings required to produce the density of 170 p.p.a. agreed for the site. No objection would be raised to the introduced of some lower building, e.g. for the old persons’ dwellings. The architect favoured the idea of decking over the site with garages under. Mr Woolf pointed out that this was likely to be expensive and very good reasons would be needed to sell the idea to Committee. The question of space heating was raised. The P.A. was informed that although under floor heating was acceptable at the moment, various alternative methods were being investigated and he was free to consider various forms of central heating. Central heating would in any event be required in the old persons’ blocks. Other matters touched upon were the provision of garages and parking spaces up to 75%, playgrounds and toddlers’ play spaces. Mr Adamson will provide further information drawings for the architect including siting for a piece of sculpture. The next meeting was fixed for 11 a.m. Monday 14 January 1963.
b) the second part of site should be a minimum of 136 persons per acre on its own. 2) The architect then presented the 21 storey project. Mr Woolfe indicated that this would result in the following allocation of dwellings. Mr Kay mentioned that the 27 storey block was possibly out of scale with its surroundings. The correct statement should be that: The 27 storey block was certainly out of scale with its surroundings. Kay. 1. Principle: That the development conforming with the general height level of surrounding buildings would have serious disadvantages and that substantial advantages to the public interest would be gained by a high building. Comment: As a landmark this building would indicate from a great distance the location of the northern approach to Blackwall Tunnel; otherwise no substantial advantages to the public interest would be gained by it. 2. Principle: That the building, from wherever it is seen, will not seriously mar the skyline nor spoil the traditional pleasing and well loved views such as those of the Palace of Westminster, and of London squares or views from the Royal Parks and the River Thames. Comment: Although this This building will not mar the skyline, it will protrude, in its isolation, on the skyline without any apparent reason. 3. Principle: That the proposed high building would look well with its immediate surroundings, both existing and proposed. Comment: A high sense of visual drama would be achieved while emerging from the Blackwall Tunnel. 4. Principle: That the amenities of surroundings sites will not be harmed nor their development possibilities unreasonably affected. Comment: Overshadowing of the area west of the proposed building in the morning hours until noon. 5. That, in view of the prominence of high buildings, developers have been successful in securing the highest quality of architectural and external finishes for their high building. Although the The general architectural handling of the project is typical of the work carried out by this eminent architect, the bulk of the building as viewed from the east or west may be open to arguments. The question of materials and external finishes of the building has not yet been discussed. A town planning application has been made to the Council for permission to develop the Rowlett Street Area, Poplar, for housing purposes. including the erection of a building of 26 storeys in height (approximately 258 feet). If you object to this proposal for any reason, please let me know, in writing, within fourteen days of the date of the notice. If you are not also the owner of the property to which this notice is addressed, will you kindly forward the enclosed letter to the owner. The plans referred to in the application may be inspected at this office (Room 457N) between the hours of 9.30 am and 12.30 pm Monday to Friday. 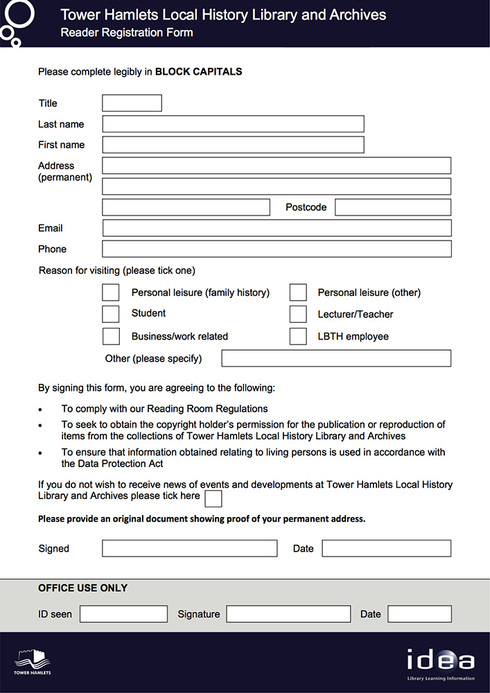 In addition to town planning consideration, the Council’s consent to the proposal may also be required under Part V of the London Building Act, 1930, which gives owners and lessees the rights of appeal against the proposed buildings over 100 feet in height within 100 yards of their property, and this notice will not prejudice any rights you may possess in this respect. Should the proposal be approved, any consent under Part V of the London Building Act, 1930, will be subject to publication and service of notice as required under the Act. As an occupier of a maisonette that is in little privacy from anyone wishing to exploit the short distance between our two buildings. As an alternative site to such proposals might I suggest the area of land further to the south of the site where the tunnel approach is __ direct line to the proposed building of 26 storeys. I must protest most strongly at the proposition. The inadequate sunlight which will ___ is a very important point to consider apart from other matters. I have made my point without submitting a drawing showing my objections but would be quite willing to do so if necessary. I thank you for your letter. I strongly object to proposed building of 258 feet high. It will be directly opposite my house, and we get very little sunlight as it is. With this block opposite, we would be constantly in shadow. During the building of the Blackwall Tunnel approach, we were constantly subject to dirt and dust, plus terrible smells from the sewers, although I realise people have to be housed. 258ft high brings to one, files for foundations, which means noise and plenty of it, and lots more dust and dirt, plus the fact there are probably lots of children to be housed in this block, and the streets around are already used for playgrounds, as there isn’t a suitable fork in this area. in reference to your letter of Jan 5th for permission to develop the Rowlett St Area Poplar including erection of 26 storey building. I am not the owner of no 8 Andrew St but I object to a building of this size being built whilst we are living here for the simple reason I am quite sure these houses will not stand up to the disturbance caused while the foundations for this building are being made we only have to close a door and parts of the ceiling fall in and my wall in the front room is ready to cave in any time now in fact all the bricks in the house are almost dust they are so old so how are they going to stand up to the racket that will most certainly go on for a building this size. Also we are going to have the light blocked out, as it is I have a light on all day its so dark in my rooms, to say nothing of the filth and dirt as it is we can’t breathe fresh air now with out having more dirt down our lungs. I have no objection to your building plans because I know this must go on but I do most strongly protest about being left in the middle of it. With reference to your letter dated 15 January, 1964, the proposed 26 storey block to be erected on the Rowlett Street Site. will be 64’ away from the nearest surrounding property. The lower block, to the north-west of the tall block, will be two storeys high, and a shop will be provided. Several children’s play spaces have been included in the scheme and the development will also include grassed areas preserving existing trees. The development complies with the daylighting code and surrounding residents should benefit from a considerably improved outlook. The London County Council are to build a 26-storey block of flats, together with a group of one- and two- storey dwellings for old people in Poplar at an estimated cost of £867,700. The proposals for the development of the site situated at the northern approach to the Blackwall Tunnel by Mr. Erno Goldfinger, an architect in private practice, have been approved by the Housing Committee. The site is bounded by Desart Street, Brunswick Road, Hamelin Street and the Brownfield Estate. In addition to the homes there will also be 84 underground garages, 10 motor cycle stores, 70 tenants stores and three play areas. Space heating will be by warm air units from an oil-fired central boiler and eight playdecks have been incorporated in the staircase and lift core.